NEW YORK (May 19, 2017) –FlightSafety International announces the start of new Master-level Advanced Training Courses for the Dassault Falcon 2000EX EASy and 900EX EASy series aircraft. FlightSafety and Dassault have worked together to develop four advanced courses specifically for Falcon aircraft. They include Advanced Upset Prevention and Recovery Training, Advanced Rejected Takeoff Go/No-Go, Advanced Crew Resource Management/Human Factors Line-Oriented Flight Training, and Advanced Energy Management. Advanced Upset Prevention and Recovery Training for the Falcon 2000EX EASy and Falcon 900EX EASy series aircraft are now available at FlightSafety’s Teterboro Learning Center. Advanced Rejected Takeoff Go/No-Go, Advanced Crew Resource Management/Human Factors Line-Oriented Flight Training, and Advanced Energy Management are also offered for the Falcon 2000EX EASy and Falcon 900EX EASy series aircraft at FlightSafety’s Dallas and Teterboro Learning Centers. The courses are part of FlightSafety’s progressive Master Aviator™ curriculum. They are designed to build upon the fundamentals covered by initial and recurrent training. Master Aviator is earned by completing advanced aircraft-specific core courses and a choice of electives. At least one FlightSafety initial or recurrent training event must also be completed every eight months. 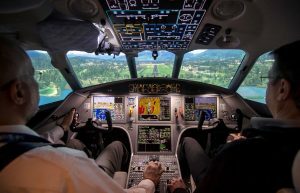 FlightSafety provides training for the complete line of current production Falcon aircraft using a fleet of 26 full flight simulators at its Learning Centers in Columbus, Ohio; Houston, Texas; Dallas, Texas; Teterboro, New Jersey; Wilmington, Delaware; and at the Paris-Le Bourget airport. The Paris Center provides training for the Dassault Falcon 10/100, Falcon 20/20-5 Falcon 50, Falcon 900B/C, Falcon 900EX EASy/DX/LX, Falcon 2000/EX, Falcon 2000EX EASy/DX/LX/LXS/S, Falcon 7X, and Falcon 8X. The Center also offers a wide variety of courses for maintenance technicians, and flight attendants.